In the United Kingdom there are more than 100,000 new stroke cases each year and approximately 1.2 million people living with the consequences of stroke (Stroke Association, 2017). In the United Kingdom, during their entire in-patient stay, a typical patient will receive around 5 h of physiotherapy (McHugh and Swain, 2014), with much of that time focused on the rehabilitation of posture, balance and walking (Wit et al., 2005). The consequences of this are that patients do not receive anything approaching the intensity of upper limb therapy that research suggests is needed to drive functional recovery (Clarke et al., 2015). Possibly as a result, long term recovery of the upper limb remains very poor. Almost three quarters of stroke survivors are left with upper limb motor problems (Lawrence et al., 2001), which seriously impact on their quality of life. There is strong evidence supporting intensive (Lohse et al., 2014), repetitive, activity-focused (Winstein et al., 2004; Alon et al., 2007; Langhorne et al., 2009), voluntary-initiated (Peckham and Knutson, 2005; Knutson et al., 2009) practice for upper limb functional recovery. However, to enable such an approach, without significantly increasing the number of therapists, we need to look to rehabilitation technologies. A number of rehabilitation technologies have been developed to encourage the recovery of upper limb motor function after stroke, including robotic devices, virtual reality and functional electrical stimulation (FES) systems (Howlett et al., 2015). Studies have shown positive results for FES in the rehabilitation of reaching and grasping function (Thrasher et al., 2008; Knutson et al., 2009), elbow extension (Thrasher et al., 2008; Hughes et al., 2010), shoulder motion (Hara et al., 2009), and stabilization of wrist joints (Malešević et al., 2012). In addition, FES offers the potential to increase therapy dose at a reasonable cost (Kitago and Krakauer, 2013), in a way that does not need the dedicated attention of a therapist. 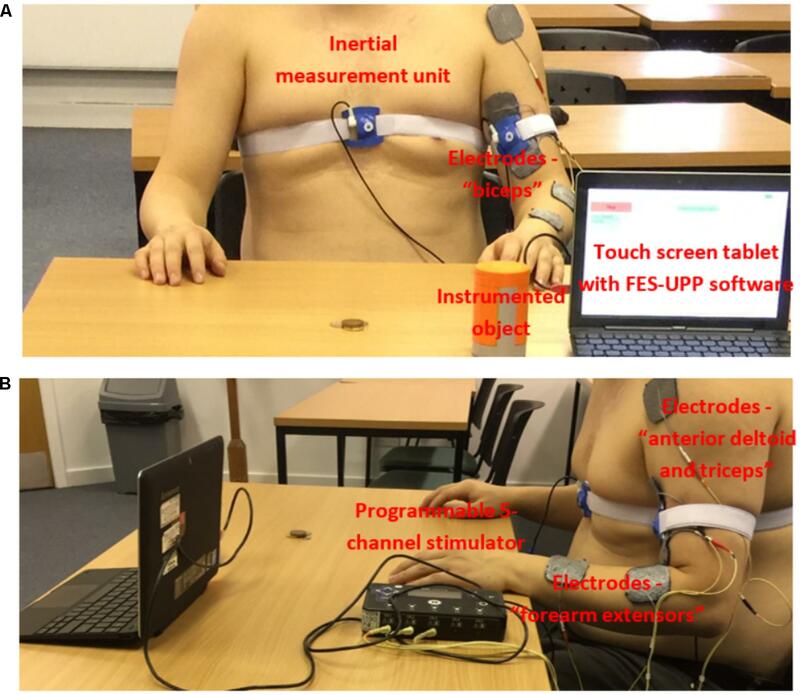 Current upper limb FES systems can be categorized according to the methods of control over stimulation. The first group of systems use a push button operated by the patient’s unaffected hand, and/or are pre-programmed to repeat a fixed sequence of timed stimulations (Mann et al., 2005). Commercial systems of this type, which tend to be used largely for passive exercising, include Odstock Medical’s Microstim 2 and 4 Channel Stimulator Kit, and the Bioness H200. The Odstock 2 and 4 channel stimulators offer flexibility over which muscles are stimulated; the H200 (Snoek et al., 2000) offers 5 channels of stimulation, but is limited to stimulation of hand and wrist. Previous studies have suggested that cyclical stimulation is less clinically effective than voluntary triggered stimulation (de Kroon et al., 2005), although debate on this issue continues (Wilson et al., 2016). A recent report identified that the carryover, or therapeutic effect, in drop foot patients was only observed in patients who showed brain activation patterns consistent with movement planning (Gandolla et al., 2016). This supports Rushton’s hypothesis (Rushton, 2003) which proposed that when the F wave resulting from stimulation coincides with voluntary intention to move, connectivity between the intact upper motor and lower motor neurons is strengthened at the spinal cord level. These studies suggest that stimulation delivered without the active involvement of the patient may not be the most effective approach. The second group of systems attempt to ensure that stimulation coincides with voluntary intention to move; thus increasing the likelihood of effective motor relearning. Examples of systems which use voluntary initiated neural signals to control FES include the EMG-based MeCFES (Thorsen et al., 2001) and STIWELL med4 (Rakos et al., 2007) systems and a small number of demonstrator projects which use brain-computer interface approaches (Müller-Putz et al., 2005; Ajiboye et al., 2017). However, reliable surface EMG signal(s) from appropriate muscles are frequently either difficult to measure or absent in people with paretic upper limbs (Bolton et al., 2004; Gazzoni, 2010), making EMG-controlled FES difficult to use with certain patients. Additionally, the voluntary effort in producing an EMG signal can increase spasticity, opposing the movement that is intended. Although systems using brain-implanted electrodes have been reported, most of the current EEG controlled systems use non-invasive electrodes, which provide limited information transfer rate, require patients to complete a significant amount of training prior to first use (Scherberger, 2009; Bouton et al., 2016), and need frequent re-calibration (Ajiboye et al., 2017). Motion-controlled FES systems offer an attractive alternative (Mann et al., 2011; Sun et al., 2016a,b). An example of a motion controlled system is the Bionic Glove (Prochazka et al., 1997) which uses data from a wrist position sensor to control stimulation of hand and wrist muscles in C6/7 spinal cord injury (SCI) patients. More recently, the Southampton group have reported on a system based on iterative learning control (Meadmore et al., 2014) in which stimulation is applied to the triceps, anterior deltoid and wrist/finger extensors muscles to support specified reaching activities. Stimulation levels are adjusted cycle-to-cycle based on kinematic data collected from previous attempts in such a way that the patient is always challenged. These motion controlled FES systems have the potential to deliver appropriately timed neural inputs to promote re-learning and hence recovery (Rushton, 2003; Sheffler and Chae, 2007) and recent studies have reported positive results (Knutson et al., 2012; Meadmore et al., 2014), including sustained improvements in function (Persch et al., 2012), and improvements even in patients with severe hand arm paralysis (Popovic et al., 2005; Thrasher et al., 2008). However, these systems are generally inflexible in terms of the number and location of muscles to be stimulated (Snoek et al., 2000; Alon and McBride, 2003; Mann et al., 2011) and/or require engineering support to accommodate a wide range of upper limb activities (Tresadern et al., 2008). Relatively little attention has been paid to the development of easy to use, flexible systems able to support a range of patients in practicing varied, yet challenging functional activities (Rakos et al., 2007; Tresadern et al., 2008). In particular, if such systems are to be widely adopted, they must be sufficiently user-friendly to remove the need for routine engineering support. FIGURE 1. Example set-up of the FES-UPP system for the “Sweeping coins” activity. (A) Anterior view; and (B) Lateral view (informed consent was obtained from all participants). This entry was posted on July 19, 2018, 21:16 and is filed under Functional Electrical Stimulation (FES), Paretic Hand. You can follow any responses to this entry through RSS 2.0. You can leave a response, or trackback from your own site.